Think carefully about the placement of your tree. Is it within easy reach of a power source? Is there enough space around the tree for it to look majestic rather than cramped? Measure the height, width and depth of the space and make a note of your maximum dimensions. If you’re buying a real Christmas tree, then take your tape measure with you so can check potential trees against your measurements. Personally, I like to buy a tree that’s slightly taller than my dimensions and then cut the tree to fit my space, but I LOVE a ceiling scraping tree. If you want to do this, remember that you often pay per foot for real Christmas trees, so be aware that you’ll pay a little bit more doing it this way. If you’ve been following Gem’s Organised Christmas plan, you’ve probably checked that your fairy lights work already, but if not, here’s your final call! Whilst checking each set, number the plug with either a sharpie or a sticker. Usually, I have around 700 lights on my Christmas tree, so that means a lot of wires and a lot of plugs! Labelling each set saves so much time when it comes to arranging the lights and removing them. It also means that if a set does go out once on the tree, you can trace the set more easily. This year, I’ve bought the ConnectGo Christmas light system from Festive Lights, so now I can decorate with up to 1600 lights, in easily connectable strings, all from one plug! If you’re in need of new fairy lights, Festive Lights are offering any of my readers or followers 10% off anything on site until 31 December 2018 using the code BEX10. If you have several sets of lights and a double power socket, be a future friend to yourself and invest in two extension cables and visually divide your tree in half vertically. Arrange the sets on the left-hand side of the tree one extension lead, and then the lights on the right-hand side of the tree on the other. When you come to remove them from the tree later, this will make life a little easier. Once all the lights are on the tree, unplug all the sets, and then plug them in a set at a time. This is your final chance to check that each set has survived the arranging process before you reach for the baubles! 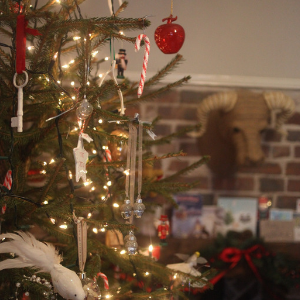 Following this tip will instantly raise your tree decorating game! The secret is to arrange your lights in a zig-zag formation, from top-to-bottom, rather than winding the lights in a spiral around your tree. The reason behind this? 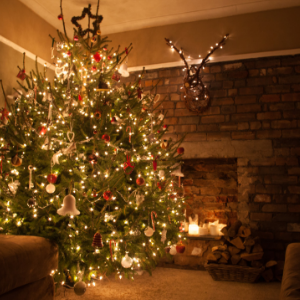 Arranging your lights from top to bottom, in A shapes about 15 centimetres apart at their widest point will ensure that they are evenly distributed and this is the key to decorating your tree like a pro. I use a pair of kitchen tongs to hang the lights over the highest branches if I can’t reach. If you want to raise your decorating game further, then use a pair of heavy-duty gardening gloves to ‘push’ each string of lights about 20 centimetres deep into the tree. This creates depth and makes the tree seem more twinkly. It also helps to disguise the wires! 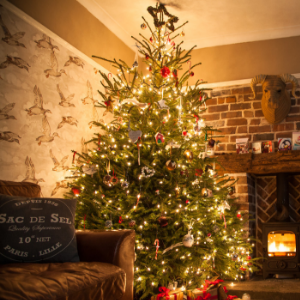 Do you want to recreate that luxurious ‘department store décor’ style on your Christmas tree? If so, it’s all about the layering! Layer up different textures, different sizes and different shades of colour if you’re going for a specific colour theme and stand back regularly to check for gaps or uneven placement. I tend to go for reds, whites, bronzes and clear decorations with a natural, woodland feel, but that’s just the look I go for. Bex Massey is a Manchester vlogger and blogger creating content on motherhood, home and style with a cosy feel. Next Post Decorate the Tree with Me!